Perfect for sound sensitive areas with limited space. 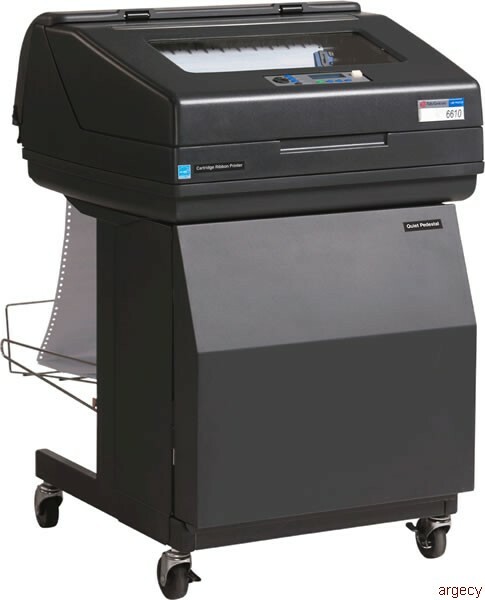 Designed to have a compact footprint, the 6600 Quiet Pedestal comes loaded with the built-in quality and performance of the top-of-the-line 6600Q quiet cabinet printer. It is designed for customers seeking a quiet, versatile, dependable pedestal-style printer for use in an office with space limitations. The Quiet Pedestal is easily moved to any space in your office on its industrial strength casters. The user can easily reach over the pedestal and collect a form from the adjustable rear tray, or walk around to access larger print runs from the lower tray. Like all the printers in the 6600 family, the 6600Q is ENERGY STAR qualified and is ready to plug into your network and start printing from day one. Enhanced reliability The completely reengineered shuttle delivers higher performance and requires less service than earlier models. Elimination of Forms Waste - A new zero tear configuration allows the benefit of zero forms waste like serial matrix printer with the reliability and cost advantage of a line printer. Enhanced Paper Stacking - With a new full power stacker that can reliably stack a full box of difficult forms; ideal for large critical batch applications. Improved Remote Management - New additions to the PrintNet Suite of tools. Continue to offer Web Panel for fast setup, configuration and troubleshooting from any web browser like Internet Explorer or Firefox without requiring any special software or software installation. For more powerful printer fleet management PrintNet Enterprise software is available. It enables remote management of groups of printers from anywhere in the world. Set up Email alerts to notify operators or IT staff of printer jams, ribbon life and equipment failures. This will result in fewer user interruptions and reduced consumable cost. The 6600 series offers seamless integration for current TallyGenicom line matrix customers. All are fully capable, direct replacements for earlier TallyGenicom printers. There is no need to modify or change current applications. It is a true -Plug and Print- solution. IntelliFilter provides the widest possible range of emulations, configurability and tools at a users' disposal. This tray is ideal for applications where the printer is placed up against a wall and output stacks are limited to short runs. Since the tray is located near the top of the printer, access from the front is easy. Selection of cartridges available to match customer's print volume and budget requirements.